Have snow and looking for ways for the kids to have fun? This DIY easy snow paint is sure to be a hit! I am also sharing some tips on how to paint snow. If you are in an area that gets snow, tossing snowballs and building snowmen can get boring after a while. If you are looking for a new easy way for the kids to have some winter fun this snow paint is sure to be a hit. Plus I am going to share a few tips on how to paint snow. As someone who lived in central New York for many years, I have had to deal with a lot of snow. That area is in a lake-effect snow area and it normally dumps a few feet at a time. So you learn to get creative with snow up there lol. There are many people up there who build all kinds of things from snow other than just a snowman. I remember seeing an awesome snow castle that someone made. 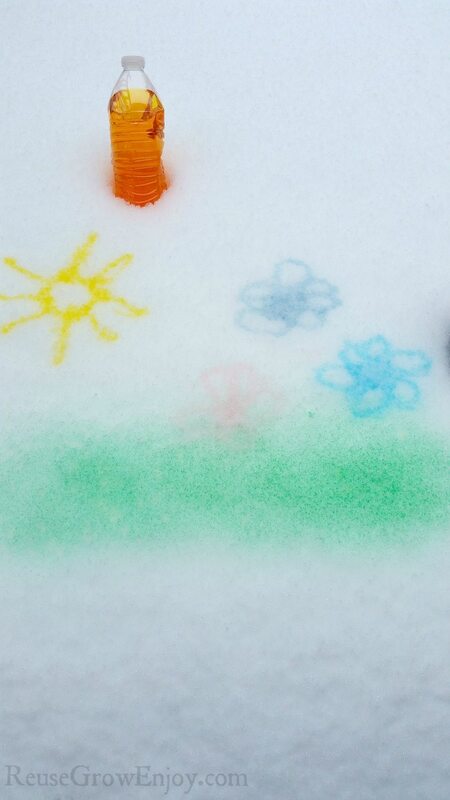 Plus they even brightened it up with some color by making snow paint! When you use snow paint it is a great way to add lots of color to the yard. It is almost like you are rushing spring here lol. Plus the great thing about this paint is that it is nontoxic and will not harm the yard. 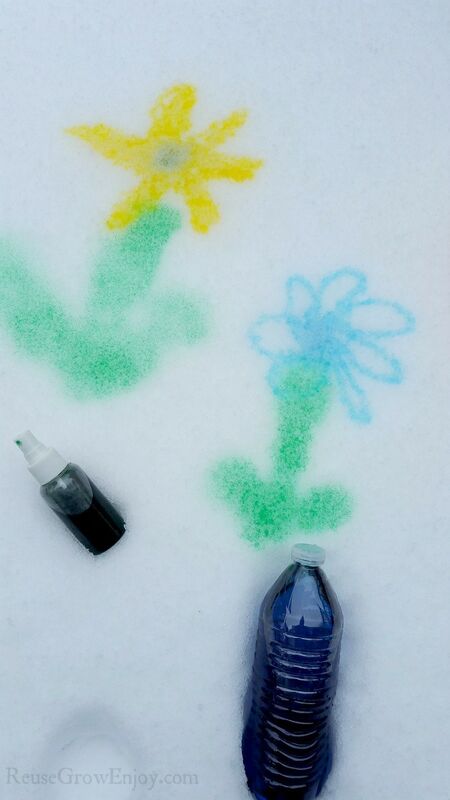 While you can buy squeeze bottles to use for you snow paint, you can also just reuse what you have on hand as I did. I reused some water bottles and a small glass cleaner spray bottle. 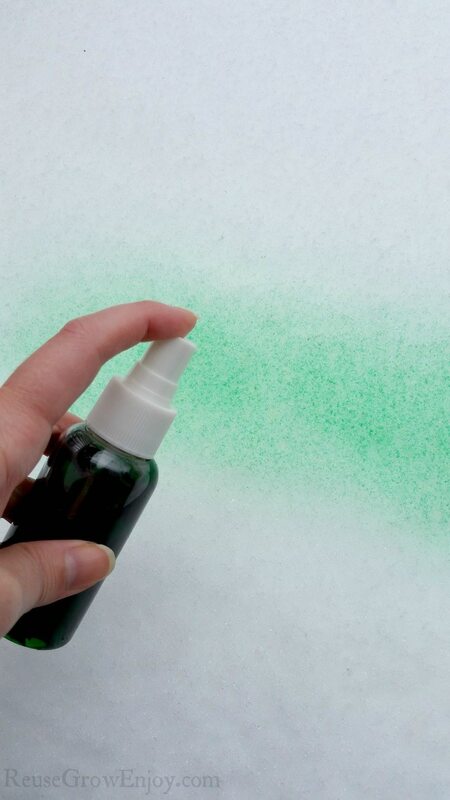 You can make this easy DIY snow paint in just a few minutes! You simply fill your bottle with water and add some food coloring to the bottle. Then put the top on and shake it up well. 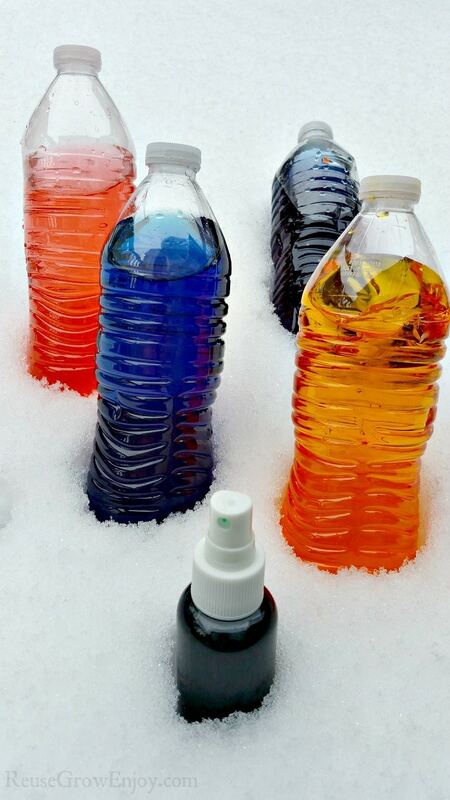 You can also mix a few drops of different colors to make your own colors. If you are using water bottles as your squeeze bottles as I did, you just need to take a needle or stick pin and make a tiny hole in the top so you will be able to squeeze out the colored water from the bottle. Sometimes we have so many things around us that can be reused and we just don’t think of it. So I wanted to point out a few items that you may have around the house that you could reuse for your snow paint. First off is water bottles like I said before. You can also use soda bottles or any smaller plastic bottle really. Another thing would be dish liquid bottles. Just be sure to wash them out well first. If you use saline bottles that have removable caps they can also be used. School glue bottles is another one that will also work. You just want to look for things that have small holes. Things like shampoo bottles have too large of a hole and just dump out the mixture wat to fast. Save hair spray bottles, glass cleaner spray bottles, throat spray bottles or any other spray bottles you may have around the house. I love using the spray bottles as you get such a more even coat of paint on the snow. In a pinch, you can use eye droppers and syringes if you happen to have any. These are always my least favorite to use as they hold just a little amount and you have to keep refilling. But they do work. Ways to work with a cold mixture is to first use cold water when mixing it. Then you can either pop the bottles outside for a little while before you want to paint or put them in the freezer for a bit. After you are done painting, store the bottles outside (if you temps will not be dropping below freezing) or if our temps will be too low, store them in the fridge. Another thing to note is you can get different effects when you are painting by using different types of bottles or sprayers. Squeeze bottles will give you more of line type painting. But if you use a fine mist sprayer it will give you wide light coverage. You can also use a stream sprayer to give you kind of a mix effect. 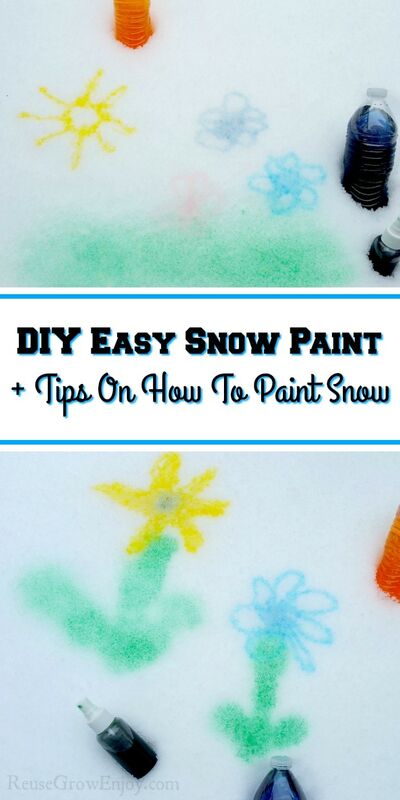 One really cool tip on how to paint snow is to use sponges and paint brushes! When you have made a snowman or a snow house give it some color. Put the snow paint in bowls and then dip a sponge in it and ring it out slightly (you may want to use latex gloves as this will color your hands). Then simply pat the sponge on the areas you want to color. You will need to re-dip every few pats. With a paintbrush, you can dip them in the mixture and then flick them at the area you want to color. This gives you that abstract art look. You will have little splatters of color all over the area. Mix it up and add lots of different splatter colors. Looking for more winter ideas? Here are some to check out.